This post is about the Canadian Directory Assistance landscape. For users, I will highlight the paid and free services available in Canada, their feature lists, and where to access ‘people search’ or residential data. On the business side I will highlight what every business owner in Canada needs to know to ensure that their business is accessible via voice search, even if you a cellular only business. The approach was simple, friends along with myself picked up the phone and started dialing. To be fair I used cellular only, as I hardly know anybody that actually has a land line anymore. I had testers using the service on different providers as well as different provinces to get a national feel. If you know of other services or would like to share your story using any of the services listed below, please feel free to comment at the end of this post. First, let’s take a look at the paid directory services. I will focus on the big 3, Telus (landline and mobility), Rogers (cable and mobility) and Bell (landline and mobility). The user side of these services are accessed directly by dialing 411 which will connect you to an automated attendant. You will then be given the option of requesting business, person or government listings. 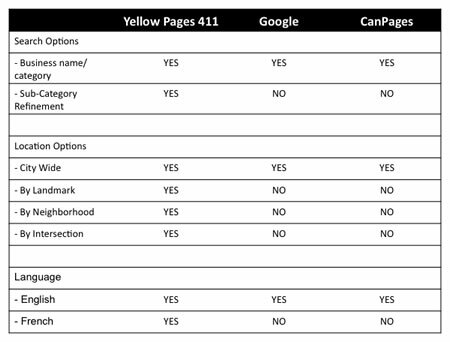 What you may not know is that for Telus and Rogers, you have the option of selecting a Yellow Pages™ category search which will connect you to the Yellow Pages™ 411 voice activated service. See below for the feature list on Yellow Pages 411. Please note that these services have different billing rates so check with your service provider. In this section we will look at 3 free directory assistance services available to Canadian consumers. Note: all these DA services will only allow you access to business name and category searches. All these services are available from a landline, VoIP, cable or mobile phone. I have included a feature list after the introduction of these Free DA services. Available through 1-877-310-9356 or by dialing 310-0411. If you live in a province that does not support 310 dialing, simply add your (area code) in front of the 310-0411. For more information please visit Yellow Pages™ 411. Available through 1-800-GOOG-411. This is the only Canadian service that also supports business listings from the US. For more information please visit Google 411. Available through 310-4110, I could not find a toll-free number. I also could not find a dedicated URL on the CanPages site for their voice service. This service is also not a national service. – we know all these services do business name and category search, but I wanted more. Therefore the sub-category search is defined as the following – if you ask for Pizza, the system will prompt you for Delivery, Take-Out or Dine-In. This is a very important distinction to help narrow results, otherwise, you will get a mash-up of services with no clear indication of whether or not a business provides the specific service you are looking for. – we know all these services do city wide searches, but again, I wanted more. Most likely voice related search will be conducted in major urban markets, therefore, the ability to narrow results via neighborhood, landmark or even via intersection, is actually pretty important. The last thing any consumer needs is to be standing in downtown Vancouver and getting a list of results that cover the entire city when what you really want is “Sushi Restaurant Near Robson and Homer”. – we know all these services will work in English. However, Canada has two official languages and the second largest province (Quebec) with a population of under 8 million or about 27% of Canada’s population is a very large market. Therefore, the ability to offer voice services in both of Canada’s official languages is very important. On this note, it is very disappointing to see a company like Google not offer their services in French, this is surprising. From a small business perspective, DA whether Paid or Free is a very important piece for making sure that your customers can get your phone number and address. Therefore, the ultimate question for any business owner is “How do I ensure that I am properly listed?”. The short-answer is simple. If you are in the Yellow Pages Directories or on YellowPages.ca, you are already listed in all the services listed above, with perhaps the exception of CanPages (CanPages does not list specifically where they purchase or get their business data from). How does your small business data flow specifically? The graph below shows the flow of data information. 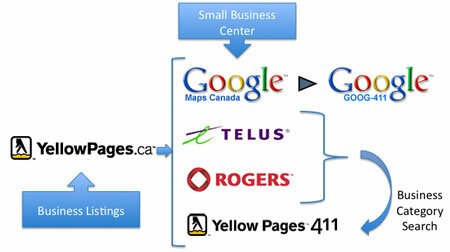 YellowPages.ca data is provided to Google Maps which in turn is what is used for Google 411. YellowPages.ca data is provided to Yellow Pages™ 411 which in turn is the service that can be accessed for free or via paid DA by Telus and Rogers customers. So having your business listed with YellowPages.ca in the right category ensures that your business data is syndicated to all these major players in providing voice directory assistance. If you are not listed, then what? Contact Yellow Pages Group to Add Your Free Listing. One FAQ – What if you’re a cell phone subscriber? Cell phone subscribers are also entitled to a free business* listing in their local Yellow Pages directory and in our directory Web sites YellowPages.ca and Canada 411. Go to the Contact Us section of this site to speak to a Yellow Pages Group representative for more info. ‘People Search‘ via voice is currently limited to the paid DA providers in Canada. I am not even sure that I have seen a voice enabled ‘people search’ service in the US – if anybody knows of one, please feel free to comment. However, if you are a lucky Canadian to own either a Blackberry or an iPhone, the Yellow Pages™ Mobile applications for Blackberry and iPhone are currently the only integrated mobile apps that provide business, residential and reverse lookup services. I hope that you find this information useful and please feel free to add your comments regarding directory assistance services. This entry was posted in 411, Directory Assistance, Voice Search and tagged 411, Directory Assistance, free DA, goog 411, Voice Search, yellow pages 411 on April 17, 2009 by Darby Sieben.